You are here: Home / All News / Articles / Father Martin Flying High – well, not quite! Father Martin Flying High – well, not quite! Father Martin was on holiday abroad for a few days recently. 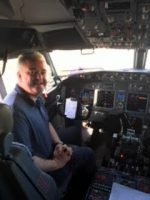 He was offered a place in the captain’s seat in the cockpit! Fortunately they were not in the air at the time, but parked on the edge of Birmingham airport while they were waited for the French air traffic controllers to sort themselves out and give them a slot to take-off. We give thanks for his safe return – as do the other passengers!